Why do you talk so white? 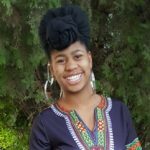 My name is Ja’Nell Gore I am 17 years old and poetry is important to me because it gives me way to be heard, let out emotions and and speak on things that matter to me. It has been my escape during anxiety attacks, by getting me to calm down and helping me breathe through those times. It has also given me a way to talk about problems in society that I feel are very important. Lastly, it has been my way to finally get out of my box and want to do more.